Mango Health Benefits for Body and Skin with Mango Recipes! Discover mango health benefits for the body, inside and out! Mangos are sweet tropical fruit varying in size and color. They can be yellow, green, orange or red. They have fleshy skin and a single pit inside carrying a seed. Mangos are the “king of fruits”. They’re a superfood, low in fat and calories. They’re cholesterol and sodium free. They’re loaded with vitamins, minerals and antioxidants! They’re rich in vitamins A, B6, C and E! They’re rich in beta-carotene! They’re rich in minerals: potassium, calcium, copper and phosphorous. They’re high in fiber. They have a cancer-protective flavonoid, quercetin. Mangos are a wise health choice. 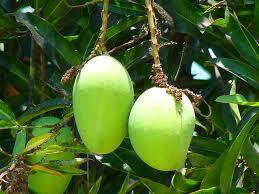 The Mango Tree, Mangifera indica, grows 115 to 131 ft. tall and is long lived. The leaves change color as the tree matures, from an orange-pink to dark red to dark green, with age. Almost half of the world’s mangos are cultivated in India, in a frost-free warm climate. - The best time to juice mangos is when they're just right...not too hard or soft. Overripe mangos won't juice well, but they're nice for smoothies. - Buy them green and hard at the store then take them home to ripen to a yellowish/red fruit. Avoid blemishes. There's no need to refrigerate. Just leave them out at room temperature to ripen. They will last 2 - 4 days on the counter if chosen when hard. 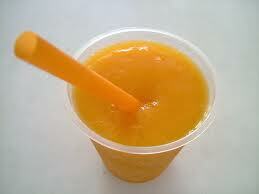 - Mangos mix well with most tropical fruits. - Remove mango skin and pitt before juicing. You can leave the skin on since it does contain vitamins and nutrients. CAUTION, though! The skin has a chemical called urushiol, also found in poison ivy. This chemical can cause itchy rashes. You may not have an allergic reaction to urushiol, but it's probably best to avoid the skin if you're not sure. mango, (peeled and pitted), canteloupe, apple, parsley, cucumber. mango, (peeled and pitted), carrots, pineapple, spinach. mango, (peeled and pitted), carrots, orange, pineapple. 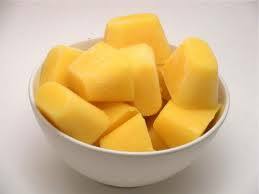 Mango butter is made by expeller cold pressing mango seeds. It’s similar to cocoa butter, with a high oleic and stearic acids. In raw form, it can be hard to spread. Once warmed it liquifies and is easier to use. It’s a “soft solid”, softer than shea or cocoa butter. Frequently, it’s mixed with coconut oil or shea butter. Mango butter has very little scent, maybe slightly sweet and nutty. It’s non-greasy and absorbs into skin easily. It’s a natural emollient, wound healer, UV protectant and skin regenerator. Mango butter is refined or unrefined. Most skin care products on the market contain refined mango butter because it keeps manufacturer costs down. During the refining process most of the beneficial vitamins and minerals are lost. Refined mango butter is less effective overall. Unrefined mango butter maintains beneficial vitamins, minerals and antioxidants! No chemicals have been added to strip away it’s nutrients. Organic, unrefined, mangos offer exceptional nutrient content! MANGO HEALTH BENEFITS at AMAZON!